Also I say just UX – because when you add « Design » people in France think it is just a visual medium (It actually means design as problem-solving, not design as in fashion or looks) – If you think that, you’ll get into trouble with your project. See my article. For me it is a way to reduce risk in your project, a way to do problem-solving and a way to break out of the design bubble to get real feedback from real users. It is not a layer or component we add – it is transverse, a way of thinking, a methodology, a philosophy, even a political ideal ! More precisions on my website. I don’t refer to myself as a UX designer, for the reasons above. I usually say « UX consultant », or at the moment I am a « UX Strategist ». Lots of pretentious titles, sorry ! I started as a usability specialist, or interaction designer. I was working as a website manager in 1998 and we were always having to do emergency fixes on the websites because the users were complaining. I started to study usability to figure out how to reduce the stress on me and my team. Normally people get into the field because they care about the users – I started off caring about me, then of course I became the voice of the user later on! Do a masters degree in UX, usability or information architecture. First degree in graphic design, computing, architecture, languages, teaching, anything! Is UX more a process or a task ? It’s a process that is comprised of tasks. The end result is a user experience that you can measure by testing with users. The process is User Centered Design – Putting the user at the center of every stage of the « design » process. Can we say UX is present in online journalism projects (websites, interactives productions…) ? Yes ! See this from the other day. Can we say UX Design methodologies (lean strategy, design thinking, Agile) are present in online journalism projects ? UX and Agile are quite a different thing – Agile is about MVP (Minimum Viable Product), UX is about MDP (Minimum Desirable Product). Well, put it this way – A great business strategy to increase online revenue will never work without UX being at the heart of it. I think the NY Times understands that with its mobile first policy. The obvious one is data journalism at The Guardian. Although remember that even though data journalism is very trendy, often you have no idea what the pretty charts or graphics are trying to say – hence the difference between visual / UI design and real UX! 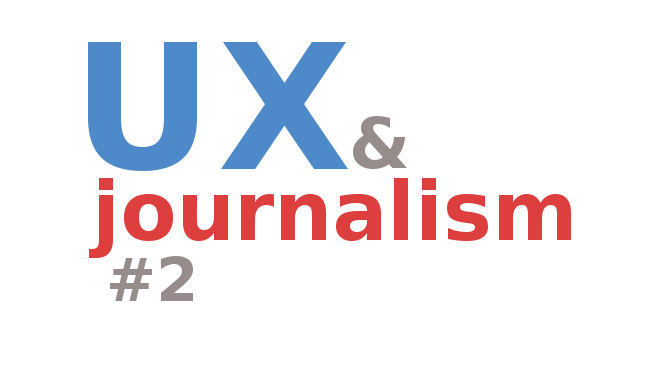 Partager la publication "Alex Poole about UX and Journalism"